Your visit to our piece of the African bush is tailor-made to suit your needs. We go out of our way to make sure you savour the best of South African hospitality and local flavor here in the North West Province. There is much to cater for the needs and desires of those in your party who do not wish to partake in the hunt. 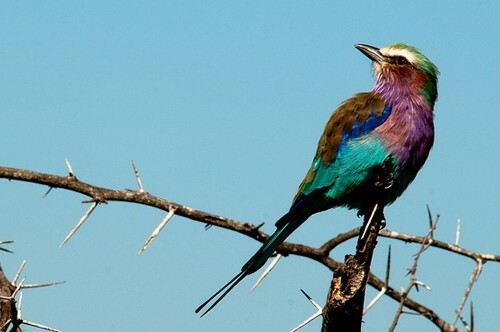 We offer game drives in open safari vehicles, guided walks and bird watching­. We can arrange spa treatments or excursions further afield to Sun City. Play tennis? We have a quirky “clay” court made of cow and buffalo dung using local traditional African building techniques. Relaxing and enjoying the many stunning vistas at leisure is always on tap – whether it’s enjoying breakfast under an acacia tree, watching a spectacular sunset or watching the many animals visit the waterhole right at the bush camp while you read a book is an experience you will never forget. Elsie’s Spa is quite popular with the wives and daughters of the hunting party who wish to take some time out for a little bit of luxurious pampering. Elsie, a qualified beautician, is our neighbour’s young wife who has opened a luxury spa offering manicures, pedicures, massages, waxes and a host of treatments. There is so much on offer at Sun City that it is suggested you stay over for a night or two. 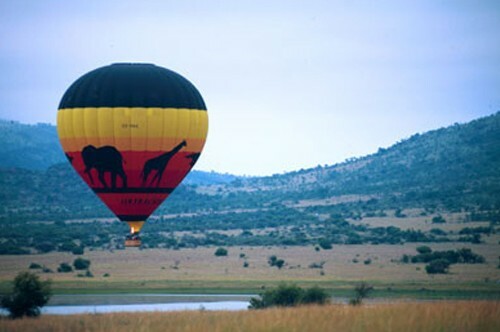 Hot air balloon rides over the big five reserve is extremely popular with our guests, or enjoy one of the daily game drives and nocturnal game drives on the famous reserve next to the world famous resort. Stay in the luxurious Palace of the Lost City, take an elephant back safari, visit the huge crocodile farm, eat at one of many fine restaurants, play golf, tennis or go gambling. Made famous by the Million Dollar Golf Challenge, Sun City is more than one destination – it’s our local mixture of Vegas and Disney with a real game reserve attached. South Africa is of course a birder’s paradise – and our area is naturally rich with local species to delight the eye and ear. To date over 250 species have been sighted. Pictured above is the Lilac-breasted Roller (Coracias caudatus), one of many interesting and colorful birds in the area. So, pack your camera and binoculars.